HMCB-103 | Size: 50 ml / 1.69 fl. oz. Preventive daily hydrating broad spectrum moisturizer SPF 30. All skin types. Ideal for face, neck, décolleté, outer ears and back of the hands. Nourishes the skin while offering full sun protection Imparts healthy glow and radiance. A lightweight, ultra-sheer, deeply hydrating, nourishing, antioxidant-enriched face moisturizer that minimizes the appearance of wrinkles while providing ultimate protection against the aging effects of the sun and environmental exposures. It offers UVA and UVB sunscreen protection using mineral based, non-chemical, non-coated, non-whitening micronized sunscreens. Unique and very complex formulation, rich in a variety of natural anti-oxidants, vitamins, and anti-aging nutrients, to restructure aging tissues and improve skin’s elasticity and firmness. 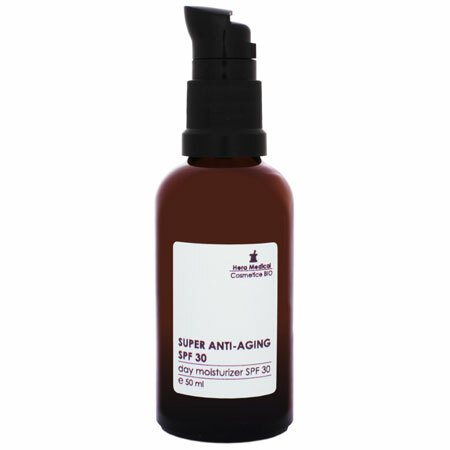 High performance anti-aging, firming, rejuvenating, protecting, and moisturizing benefits. Due to the high percentage of organic ingredients used by HERA MEDICAL, small changes in the texture, color or smell of the products may appear | occur. These variations do not affect the quality and effectiveness of the products. APLICATION: In the morning, apply a sheer layer on the clean skin of the face, neck and décolleté. Also apply on the outer ears and on the back of the hands. Apply ideally after your facial serum. Finish with a facial mist. MD PhD Raluca Hera is the founder of HERA MEDICAL. 15 years ago she began formulating her own line of organic cosmetics. Due to her medical background, when working on a new product formulation, beyond being natural and organic, Raluca Hera is focused on results. Her products are developed using the most advanced natural skincare technology available. The REGENERATION & REPAIR line from HERA MEDICAL uses a synergistic combination of age-defying ingredients (peptides, low molecular weight hyaluronic acid, DMAE, alpha lipoic acid (ALA), precious organic oils, vitamins) aimed at significantly improving the appearance of mature complexions. It is a perfect blend of science and nature, combining advanced cosmetics technology with the best of nature's organic ingredients. The result is a product that forms the basis of an effective, “clean” skin care program. HERA MEDICAL cosmetics are being used by selected spas in Romania, France, China and United States. In the morning, apply a sheer layer on the clean skin of the face, neck and décolleté. Also apply on the outer ears and on the back of the hands. Apply ideally after your facial serum. Finish with a facial mist. INGREDIENTS: KANGEN WATER, ARGANIA SPINOSA (ARGAN) KERNEL OIL, CETEARYL OLIVATE, SORBITAN OLIVATE, ZINC OXIDE, TITANIUM DIOXIDE, ALUMINUM HYDROXIDE, LAURIC ACID, CETEARYL ALCOHOL, GLYCERIN, GLYCYRRHIZA GLABRA (LICORICE) ROOT POWDER, CAPRYLIC CAPRIC TRIGLYCERIDES, UBIQUINONE (COQ10), HYDROLYZED WHEAT PROTEIN, PANTHENOL, THIOCTIC ACID, ANTHEMIS NOBILIS (CHAMOMILE) FLOWER OIL, CALENDULA OFFICINALIS (CALENDULA) FLOWER OIL, BENZYLALCOHOL-DHA, SODIUM HYALURONATE, CAMELIA SINENSIS (GREEN TEA) LEAF POWDER, ARNICA MONTANA (ARNICA) FLOWER EXTRACT, RETINYL PALMITATE, MAGNESIUM ASCORBYL PHOSPHATE, TOCOPHEROL, BISABOLOL, XANTHAN GUM, DIMETHYLAMINOETHANOL NATURAL (DMAE), CITRUS BERGAMIA (BERGAMOT) PEEL OIL, MELALEUCA ALTERNIFOLIA (TEA TREE) LEAF OIL, ROSA DAMASCENA (ROSE OTTO) ABSOLUTE, CANANGA ODORATA (YLANG YLANG) FLOWER OIL, LAVANDULA LATIFOLIA (LAVENDER) OIL.